Stratis Gayner is the first practice in or around Harrisburg, PA to offer KYBELLA® injections for submental fat reduction. These double chin injections are an innovative non-surgical solution for one of the most common and stubborn cosmetic concerns women and men face as they age. KYBELLA® is the first and only FDA-approved, non-surgical treatment for reducing fat beneath the chin, and we use it to help our patients achieve a slimmer, sleeker neck contour with a series of simple injections. To learn more about KYBELLA® and other non-surgical treatments from our practice serving Harrisburg, Lancaster, and surrounding Pennsylvania communities, Request a consultation with Dr. Gayner online or call our office at (717) 728-1700. 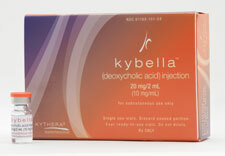 KYBELLA® contains a synthetic version of a substance called deoxycholic acid, which the body produces naturally in the digestive system to help break down fats that we eat. When this chemical is injected into the fat beneath the chin, it acts in much the same way, breaking down the walls of fat cells. The body then flushes away the damaged fat cells, leaving a more refined profile and reduced double chin. Because fat under the chin, also called “submental fat,” is so stubborn, even very fit and athletic people can be frustrated by it. In the past, the only solution was liposuction, but KYBELLA® offers a non-surgical alternative. You have fat on your upper neck, contributing to the appearance of a double chin. You have relatively elastic skin, meaning it will “bounce back” once fat is reduced. You would rather avoid a surgical procedure. For patients who have loose neck skin in addition to excess fat, a procedure such as a face and neck lift may be more appropriate. We also offer Ultherapy™ as a non-surgical option for tightening facial and neck skin. Dr. Gayner and our team are happy to evaluate your skin and help you find the best solution to suit your goals. Much like dermal fillers and other injectable treatments, a KYBELLA®session is a quick, simple process. We begin by cleansing the area beneath your chin and administering a local anesthetic to ensure your comfort. We then mark your skin to carefully plan the injections. Most patients require several injections spaced about a centimeter apart through the area of fat they want to shrink. The entire process takes only about a half-hour. After your procedure, you can get back to your regular routine immediately, although there may be some visible signs of the injections. Minor redness, bruising, and swelling are common and temporary. For best results, most patients require 2 to 4 treatment sessions spaced about a month apart, although up to 6 sessions are possible. Dr. Gayner and our team plan the number of treatment sessions with you based on your unique condition and goals. Results begin to become evident after about 2 weeks as your fat cells are flushed from your body, with the effect increasing after multiple treatments. The smooth, refined profile you achieve can last indefinitely, especially if you maintain a stable weight and practice good lifestyle habits.